The administration of Agudath Israel of America, in tandem with the organizers of its upcoming 93rd Annual Convention, are pleased to announce that the Z’kan Ha’ Mashgichim from Eretz Yisroel, Harav Dov Yaffa, Mashgiach of Yeshivas Knesses Chizkiyahu of K’far Chassidim, will be joining the Convention for Shabbos. The Mashgiach, well known throughout the world as an exemplar of mussar and middos, will be giving a mussar vaad to the Convention attendees. 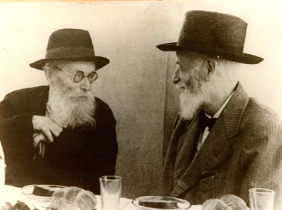 Born in Poland in the early 1920’s, the Mashgiach moved to Eretz Yisroel when he was seven years old, and as a teenager learned at the feet of such legendary Torah giants as Rav Eizik Sher, Rav Eliyahu Dessler, Rav Chatzkel Levenstein and the Chazon Ish. 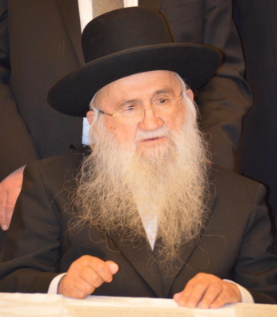 Shortly after his chasunah, he was invited by Rav Elya Lopian to serve as Mashgiach in Yeshivas Knesses Chizkiyahu, a position he has held for close to 60 years. 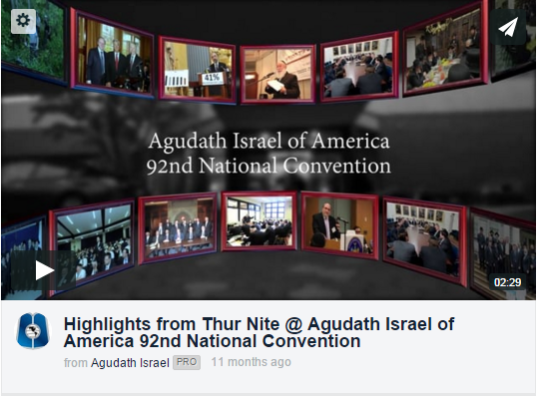 The 93 rd Agudath Israel of America Convention. Building on the resounding success of previous years and other venues, this year’s convention will be held in the beautiful and newly renovated Crowne Plaza Hotel in Stamford, CT, November 12-15, Parshas Toldos. The convention will feature its trademark blend of camaraderie, inspiration and chizuk. A highlight of the convention will be the presence of the Sadigura Rebbe of Bnei Brak, member of the Moetzes Gedolei HaTorah of Eretz Yisroel, as well as members of the Moetzes Gedolei HaTorah of the United States. The convention will also be enhanced by the presence of Dayan Yonoson Abraham, Dayan of the London Bais Din. The convention will consist of a fascinating blend of interactive breakout sessions and major keynote sessions which will enable each participant to customize their ‘own’ program. The Thursday keynote program will feature greeting from the Moetzes Gedolei HaTorah, Rabbi Shmuel Kamenetsky, Rosh HaYeshiva, Yeshiva Gedolah of Philadelp hia; an address by Rabbi Elya Brudny, Rosh HaYehiva, Mir Yeshiva; Dayan Yonoson Abraham of London and Rabbi Ephraim Eliyahu Shapiro, Rav of Shaaray Tefilah, North Miami Beach, Florida, will address the convention theme. The Motzoei Shabbos program will be addressed by the Sadigura Rebbe; the Novominsker Rebbe, Rabbi Yaakov Perlow, Rosh Agudas Yisroel (via video from Eretz Yisroel); Rabbi Uren Reich, Rosh HaYeshiva, Woodlake Village; and Rabbi Chaim Dovid Zwiebel, Executive Vice President, Agudath Israel of America. The convention will conclude with a Sunday keynote session dealing with the poignant topic OTD: Why Are They Leaving, What Can We Do About It, addressed by Rabbi Moshe Tuvia Lieff, Rav, Agudas Yisroel Bais Binyomin; Rabbi Mordechai Becher, Senior Lecturer Gateways; Rabbi Dr. Yitzchok Lob, licensed psychologist. The complete program is available at http://www.yourconvention.org/program/. The theme of this year’s convention is Igniting the Leader Within: Yourself, Your Family, Your Community. The convention organizers are promising a fascinating and exciting program with numerous, interactive breakout sessions which will enable everyone to get involved. In addition to the program there will be a large exhibit area, including an historic exhibit commemorating the life of Moreinu Yaakov Rosenheim and the first half century of Agudas Yisroel, produced by the Kleinman Holocaust Education Center (KHEC). A limited number of rooms are still available. For further information or to register, please call 212-797-7380 or email convention@agudathisrael.org . This November marks 50 years since Moreinu Yaakov Rosenheim’s passing. Over the ensuing decades, his archives were maintained in private hands in Israel and the United States. The Kleinman Holocaust Education Center (KHEC) is proud to announce the reunification – and soon to be available catalogue access – of the Rosenheim Collection, for the first time in more than half a century. 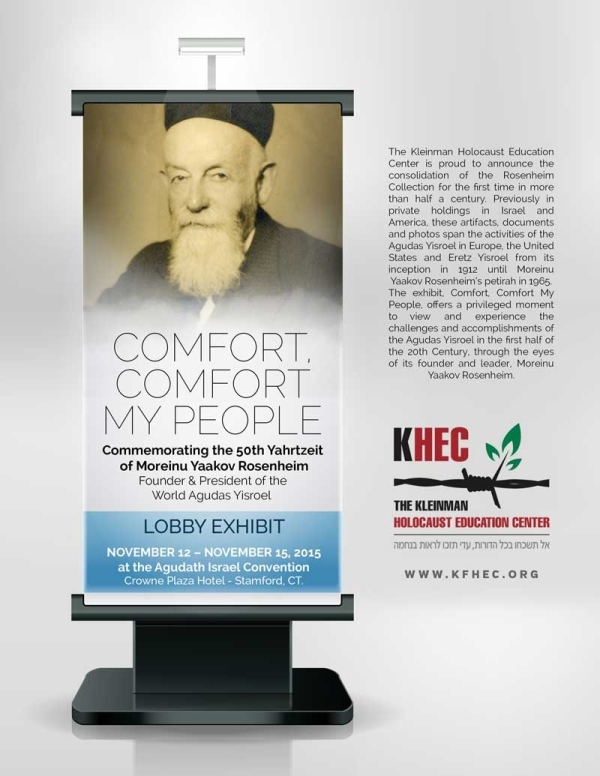 In honor of the yahrtzeit, the KHEC will be featuring an historic exhibit at the upcoming Agudath Israel Convention, to be held in the Crowne Plaza Hotel in Stamford, Connecticut, on November 12-15. 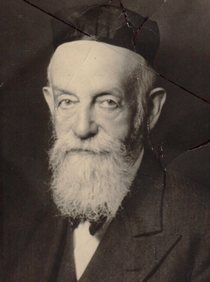 The Exhibit will highlight rare artifacts, documents, and photos from the Rosenheim Collection spanning the activities of Moreinu Yaakov Rosenheim and the Agudas Yisroel in Europe, The United States, and Eretz Yisroel from its inception in 1912 until Moreinu Yaakov Rosenheim’s petirah in 1965. 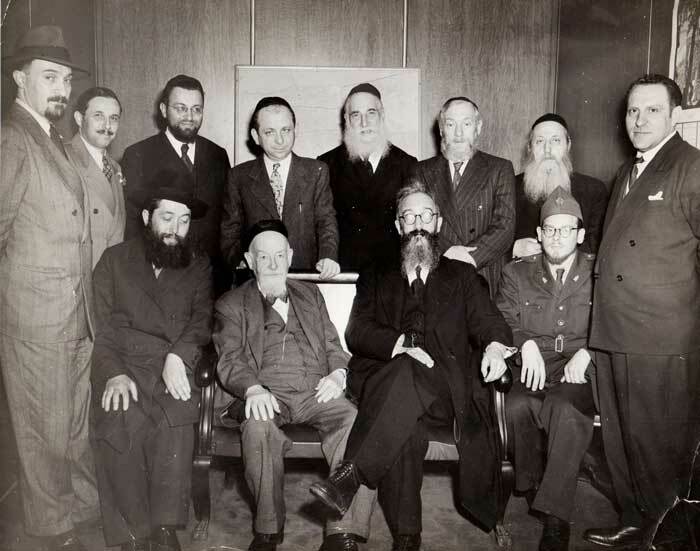 The exhibit Comfort, Comfort My People offers a privileged moment to view and experience the tremendous challenges and accomplishments of the Agudas Yisroel, in the first half of the Twentieth Century, through the eyes of its founder and leader, Moreinu Yaakov Rosenheim.